My imagery derives from the tension between experience of personal identity in contrast with the larger popular culture roles. Focusing particularly on girl culture and its intersection with performed motherhood. How the popular cultural identities cause tension and pressure within the individuals who cannot fully perform their idealized roles creates disconnection between self and others. 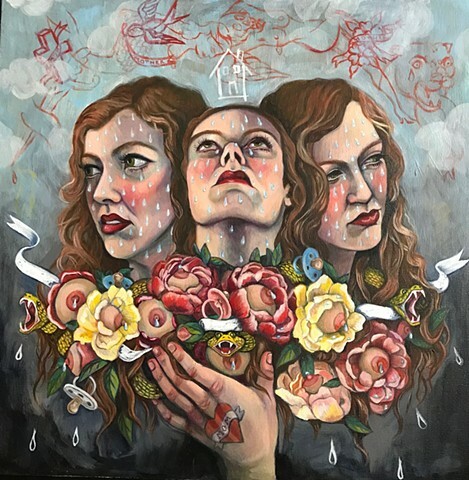 To capture this disconnection in a visual language I paint loosely biographical oil paintings depicting myself and my daughters. Hyper floral wall papered rooms are the stage for the tableaux of figures in various stages of make believe. Shrouded ghosts, steely eyed children in strange costumes, floating heads with doll furniture in their hair create a fairy tale like narrative. Sometimes the figures are completely absent and all that is left is a respectable floral wall papered pattern interrupted with childhood vandalism. Trompe l’oeil stickers and scrawled crayon marks interrupting the matronly consistent wall motif. Motherhood, childhood, family, sexuality, death, spirituality, love and identity all swirl in a distinctly feminine aesthetic rooted in inspiration from Frida Khalo, Alice Neel and Louise Bourgeois.